Introducing our new herdsire! Grey Fox....the beautiful grey son of Snowmass Sterling Legend (imported to Germany). First time out 2 firsts and a reserve color champion at 2013 IAO Cottage Division. (reserved to our US Steel) 2013 Futurity and 2013 Nationals Fleece show 2nd place with a 19.5/20 for fineness and handle. 2014 IAO 1st and Color Champion Commercial Fleece. 2014 IAO 1st and Color Champion Cottage Division. 2015 GWAS Fleece Show: 1st and Reserve Color Champion. US Steel daughter, Snowmass Andean Night grandaughter. ROCKSTAR's Foxy Lady is not only one of our up and coming stars, but however was the undisputed STAR of a wedding styled photo shoot at our ranch on the very day she was born. Not at all camera shy, this little lovely graced "The Knot" featured photo shoot with her gorgeous color and heavenly sweet temperament at the noteworthy age of about 1 hour. She is the daughter of our own ROCKSTAR's Iron Maiden (U.S. Steel daughter) and Janus' Grey Fox of Granite Bay. 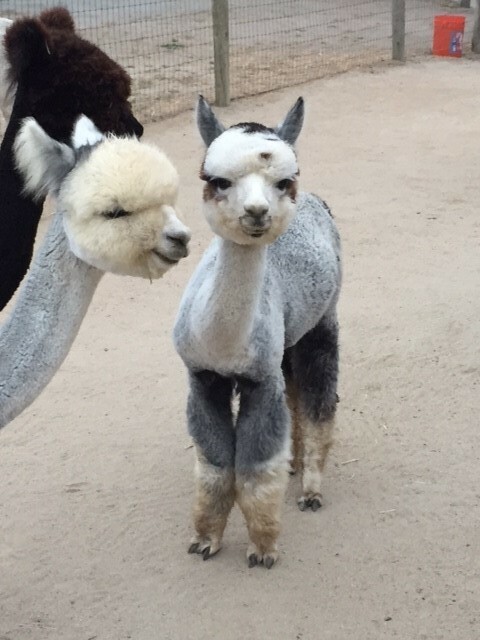 Maiden is a farm favorite given her sweet temperament and rocks a seriously fine and beautiful medium silver grey spotless fleece. Grey Fox is a color champion who passes down some serious volume to his offspring. Foxy Lady is well conformed and compact with very nice bone, a pretty head, nice top line and has a perfect bite. Her fleece is a beautiful medium silver grey and is super fine and uniform. We're excited about getting her into the show ring next spring - stay tuned for updates on this sweet little foundation girl.